Wild horses Smokey, left, and Slater, part of Wildhorse Ranch’s bachelor band. Here’s why horses should be considered native in the Americas. The relationship that evolved over millennium upon millennium between the prairie range-land biome and wild horses is accurately defined as ‘symbiosis’, where the smaller organism is the symbiont. Of all the large herbivores that currently roam the American range lands, horses are the only large grazing herbivores that have a single stomach. This is very important in that, unlike other large grazing herbivores, wild horses have comparatively poor digestive systems and as a result, most of the grass and plant seeds that they eat pass through their digestive systems and are deposited back onto the range along with composted fertilizer. Many gardening articles speak about this phenomenon as a problem because in the home garden it is; undigested grass seeds can be a nuisance if you’re not looking to cultivate grasses. (“Horse Manure – Probably one of the easiest manures to find locally, it’s a good all-purpose product, but like cow manure, not necessarily high in nutrients. Since a horse only digests one-quarter of the grass and seeds it eats, its poop is high in weed seeds.” – National Gardening Association). This is in stark contrast to herbivores that are ruminants (such as cows), which have very effective digestion as a function of complex stomachs capable of fermentation. As we consider these facts, it becomes obvious that ruminants which graze on the American (and elsewhere) rangelands do not pass viable seeds back onto the lands they have grazed, and therefore leave only feces behind. Clearly, the relationship between the biome of range-land grasses and wild horses is mutually beneficial and is a true symbiosis that is the result of coevolution over hundreds of millennia. The wild horses are nourished by the grasses, who in turn benefit from the spread of their viable seeds mixed with a nutrient rich compost back onto the range and distributed over relatively large areas. This reseeding of the range-land is accomplished effortlessly by wild horses. So as we see, cattle (and other ruminants) consume the range-land grasses and the vast majority of the seeds consumed are fully digested, leaving only feces behind as they move through the range; there is no effective re-seeding of the grasses that have been consumed. In light of the symbiosis between rangeland grasses and wild horses, it certainly makes sense that wild horses would be a native species on the range, and cattle would be the invasive species in role that may be correctly considered a largely ‘parasitic relationship’ with the range; feces (fertilizer) without seed is of little use. Wind-blown seeds may not necessarily travel far enough to reseed areas in need, nor would they necessarily land in optimal growing conditions containing nutrient-rich compost. All things considered, any reasonable person would conclude that wild horses are a native species. However, in recent years molecular biology has advanced the debate well past any doubt; all horses evolved on the North American continent, and American wild horses are in fact a ‘native species’. “The issue of feralization and the use of the word “feral” is a human construct that has little biological meaning except in transitory behavior, usually forced on the animal in some manner. Consider this parallel. E. Przewalskii (Mongolian wild horse) disappeared from Mongolia a hundred years ago. It has survived since then in zoos. That is not domestication in the classic sense, but it is captivity, with keepers providing food and veterinarians providing health care. Then they were released during the 1990s and now repopulate their native range in Mongolia. Are they a reintroduced native species or not? And what is the difference between them and E. caballus in North America, except for the time frame and degree of captivity? 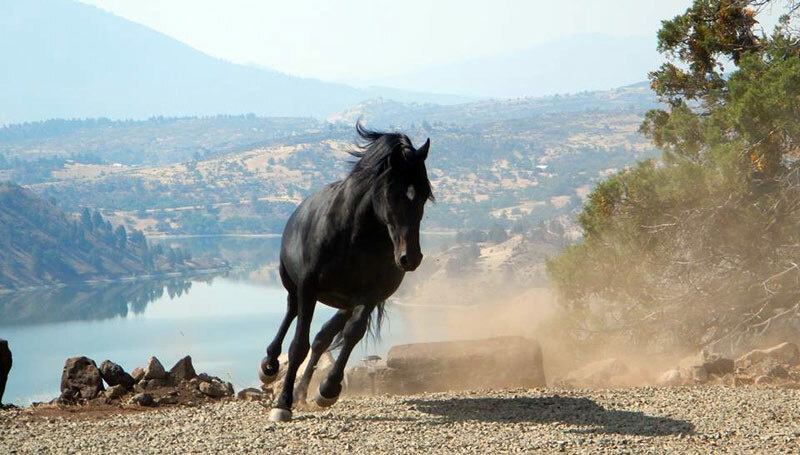 “Can Arabian horses survive in wilds of a mountain wilderness? Yup! We have two wild (feral) Arabians that range on our lands … and they are special,” writes William Simpson. Native status for wild horses would place these animals, under law, within a new category for management considerations. As a form of wildlife, embedded with wildness, ancient behavioral patterns, and the morphology and biology of a sensitive prey species, they may finally be released from the “livestock‐gone‐loose” appellation. As Ross MacPhee, an evolutionary biologist and curator of mammology at the American Museum of Natural History, said, it’s “complete absurdity” to consider wild horses as non-native. A very nice article with an interesting perspective. Only one small problem, and that is the identification of equine feces as compost with seeds. It is only that…feces with seeds. If it were truly compost , the actual process of composting would render the seeds non viable. Instead we have raw manure with seeds. Composting is the reason that it is a better fertilizer for a gardener than just raw manure as the process prevents germination of any seeds contained in the original manure. This is why I compost manure before spreading it on pastures and hay fields…the elimination of weed seeds. Out on the range, when horse droppings hit the ground, they are at body temperature (100 degrees (F) nominally), and break-up into small pieces upon impact with the ground, which increases the surface area of the pieces. Generally, on average, the ground temperature will be much less than the body temperature of a horse. The ground is a massive thermal energy sink (AKA ‘heat sink’) and will tend to moderate the temperature of anything that is thermally coupled to one degree or another to approximate localized ground temperature, based upon many variables, which are beyond the scope of this reply. Additionally, depending upon air temperature, the moisture contained in the horse manure laying on the open ground will begin to evaporate, and that has a net cooling effect on the feces (horse manure), where the warmer the air, the faster evaporation occurs as does cooling. And when the moisture content is reduced to that of the ambient humidity, the plant materials (cellulose) in the feces starts acting as an insulator, which tends to protect the seeds from any further heating or cooling. Simply put, in a single horse dropping laying out on the open ground, there is insufficient mass (and too much surface-area exposed to open-air) to cause the heated ‘composting’ effect to which you infer in your comment; it just doesn’t happen out on the range. It may be possible for some heated ‘composting effect’ to occur in a very large stud-pile on a hot summer day, but beyond that, the notion that random horse droppings will self-heat and heat-compost is of course, a non-starter. In the article I used the term ‘compost’ loosely in regard to the fact that the seed is contained in a medium that would generally offer the grass seeds inside a far better opportunity for germination that in other situations (I.E. laying on top of bare ground). And in my own defense of the use of the word ‘compost’, it should be noted that the process of composting (not pasteurization) occur at low temperatures over time due to breakdown and decay of feces by organisms and fungi without the presence of any elevated temperatures, which however does not kill seeds or pathogens, which is why specific pasteurization (heating over time) is needed for that purpose. Plants have evolved with many defenses including symbiotic bacteria and chemicals, some of which are integrated into the seeds of the same plants. Your point is well taken and provided an opportunity to clarify the difference between composting via decay versus composting via pasteurization. I appreciate the chance to clarify what I meant, and had not intended the article as a scientific treatise on composting. Excellent article – Thank You – I shall now try to ‘share’ but first wanted to make sure I had made comment! A weed is only a plant out of place as my Gran had always said.